It is defined as the force experienced by a unit positive charge placed at any point in the electric field. It is represented by symbol E and measured in newton per coulomb. Higher the value of E, stronger is the electric field. Consider a positive charge of Q coulombs placed in a medium as shown in the Fig.1. Let a unit positive charge is placed at a distance of d meters from the charge Q. The field intensity at the point where unit positive charge is placed can be obtained from force experienced by unit positive charge. The similar concept can be used to obtain the relation between electric field intensity and electric flux density. 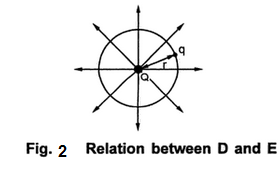 Let there be a point charge of ‘Q’ coulombs placed at the centre of the sphere of radius ‘r’ meters. The small positive charge ‘q’ coulombs is placed at a distance ‘r’ from ‘Q’ on the surface of the sphere as shown in Fig.2. Electric field strength is given by force per charge.